This Army Retired pin is the official retirement lapel pin for U.S. Army Veterans that retired before 2007. The pin's size is 5/8" in diameter. The center of the pin is gold and features the seal of the United States Army. 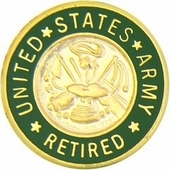 The outer circle has four stars and reads United States Army Retired in gold lettering on a green background. The army switched to a retired pin featuring the Army star logo for veterans retiring after 2007.